HMF required additional office space. We already had a first floor office area on an existing mezzanine floor together with an open storage area for archive materials. The existing first floor office area was increased by approximately 65% whilst maintaining extensive stocks of storage equipment below. Re-siting pallet racking in our warehouse to accommodate mezzanine extension. 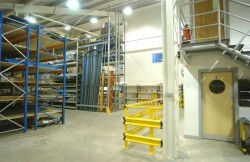 Clearing existing storage platform area of racking, handrail and loading gate. Forming 3 openings in external wall for 3 new windows. Dismantling the existing jumbo stud partitioning forming the perimeter of the existing office area. Constructing a new jumbo stud partitioning around the new mezzanine floor perimeter. Erecting new internal office partitioning creating a large open plan office with individual offices along one side of the wall. Installation of new suspended ceiling / lighting / emergency lighting / fire alarm modifications / flooring / cupboard walling /desks and general decoration works. 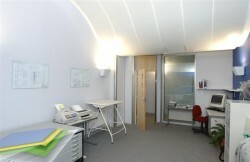 The work carried out transformed the first floor mezzanine into a very large, open working environment. 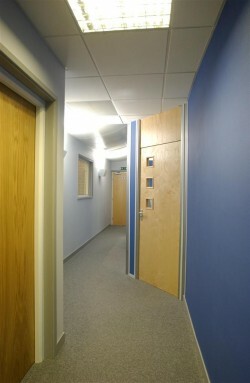 There was plenty of natural light / storage space and 4 separate offices for department managers. We also managed to keep a section of existing office area with a designer curved suspended ceiling, and converted it from a drawing office room to a training and meeting room.